Taking care of product page and appearing attractive to users is, among others, a must. Check out complete App Store Optimization guide that will come in handy to plan an strategy. As of October 2018, there are about six million apps available in the leading app stores (Google Play and App Store), and the number increases if we take into account minor markets (Windows Store, Amazon AppStore, Blackberry World…). That means there’s an enormous competition out there. The thing is… How can we stand out and get more traffic and downloads for our app or game? 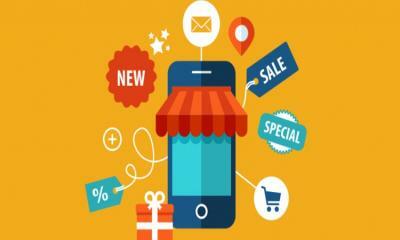 The answer is really simple: App Store Optimization. Today we are going to see how ASO can help improve an app’s visibility and Conversion Rates. 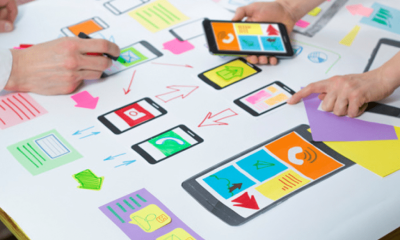 Taking care of the product page and appearing attractive to users is, among others, a must. We are sharing a complete ASO guide that will come in handy to plan an strategy. Keyword research. Read more about ASO keyword research here. Optimize for search and conversion. Improve your listing in the App Store and Google Play, as well as the Conversion Rate by using A / B testing. Tracking and improving (and localizing) main KPIs, such as keywords ranking and competitors’ rankings, conversion rate to install, organic installs, etc. It’s really important to keep in mind that ASO is a never-ending process, as there is always room for improvement and optimization. Keep analyzing your strategy and look for ways to keep improving! It improves app discoverability, as an optimized product page will rank higher and, therefore, it will make the app easier to discover. It improves Conversion Rate to Install, as the more the traffic, the more probabilities you have they download the app. Low acquisition costs: if you run paid marketing campaigns, more organic installs will derive in lower acquisitions costs. 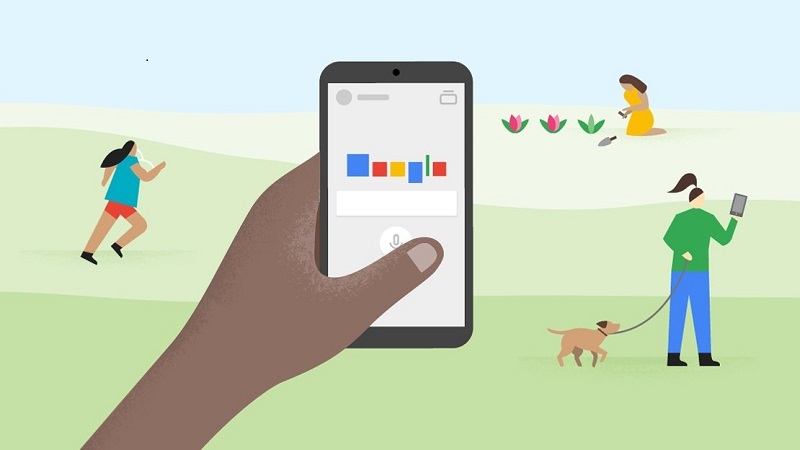 On-metadata factors, which are the ones in control of the developers and can be easily edited from either Google Play Console or App Store Connect, such as App Name / Title, Subtitle (App Store) or Short Description (Google Play), Keywords Field and Promotional Text (App Store), Icon, Screenshots, Feature Graphic (Google Play) and Video. As you can see, both visual and textual assets can be optimized. Off-metadata factors, those that can’t be controlled but are influenced by developers so as to improve them. Some of them are Installs, Average Rating, Ratings and Reviews. If you are interested in further reading on ASO Factors you shouldn’t miss this ASO Factors Expert Survey, on which 60+ mobile app marketing experts shared their opinion on the effect of different on-metadata and off-metadata factors. This is the first step to take when starting to implement an ASO strategy to your app or game. It’s vital to study the market in order to know your competition, as well as what are the tactics they use. This will help you outrank them. Once you have done your homework, the next step to follow is to work on the keywords you are aiming to rank for. However, when it comes to new apps and games it can be really tough to challenge big companies and top apps for popular search terms, so it’s important to choose wisely the keywords we will use. A good path to follow would be to go for mid- and long-tail keywords, which are a combination of keywords for a more specific search. Although it may seem more difficult to rank for specific queries, you should consider that conversion on these terms is higher because the probability that the user finds exactly what he is looking for is also higher. They have less volume of traffic but also less competition, so trying many combinations of long-tail keywords could work really well. This will translate into an expansion of visibility in app store search. 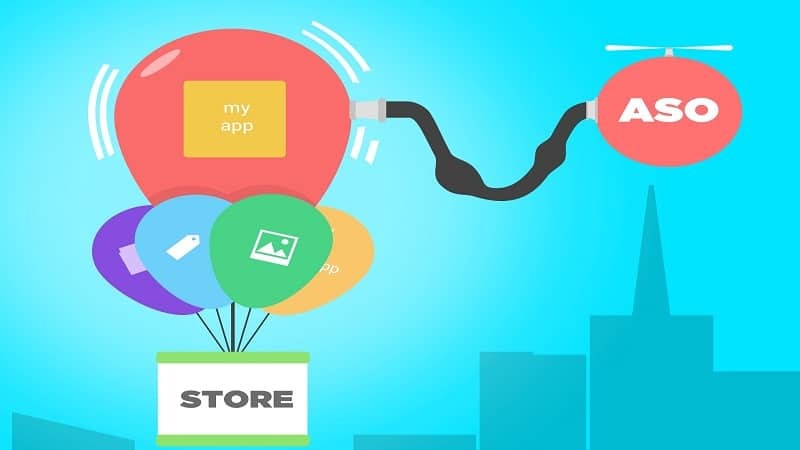 When it comes to optimizing an app’s listing, we should take into account that strategies should differ depending on which app store are we aiming to improve. Therefore, there are several things that we can (and need to) apply on Google Play Store but that aren’t possible to do on the Apple App Store, and vice versa. We’ll share a brief guide of differences between both app stores. On-Metadata factors in both app stores can be divided in two: textual fields and visual assets. Let’s see which factors we should work on. In terms of Text, the Title is one of the most important factors and it has to contain the leading keywords, those for which users will find the app. Keep in mind that it’s possible to use up to 50 characters, that can be complemented with a Short Description of 80 characters. It affects ASO regarding search and Conversion Rate. The last textual field to consider is Description, that concedes up to 4,000 characters and should contain targeted keywords that will help to get higher rankings. 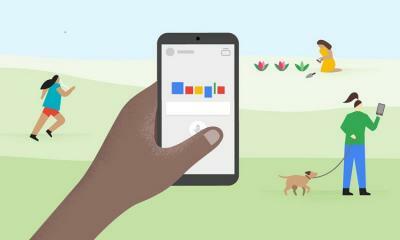 Regarding the visual assets, Google Play has a unique feature that is a feature graphic that takes up nearly a third of the screen and can include a video. It’s important to make this content representative of the app, as it is the first impression the user has on it. The Icon is also a crucial visual asset to optimize, as it is the image of the app and it needs to stand out in the browse page. Another vital visual asset is the Screenshot Gallery, that lets you place 8 images and also videos. If you’d like to read more on how to do Google Play ASO, don’t miss this guide! As stated before, we will also see the textual fields and visual assets that should be taken into account regarding Apple App Store ASO. The first text field on which we should work on is the App Name. It’s one of the most important factors and it has to contain some of the leading keywords. It allows to use 30 characters, so choose your words wisely. However, one of the differences of the App Store is that it includes a 30-character Subtitle on which you can also include some keywords. Then we have the Description, that should be no longer than 4,000 characters and it is not relevant for Search ASO, but it is key for marketing purposes. Last but not least, App Store also offers a Promotional Text Field that can be an edit at any time to inform of updates, events and such, and a Keywords Fields, that it’s not public and includes the keywords for which we opt our app to rank for in a maximum of 100 characters. As we were saying before, visual assets are items that focus more on marketing than ASO, but they are crucial in terms of Conversion Rate. 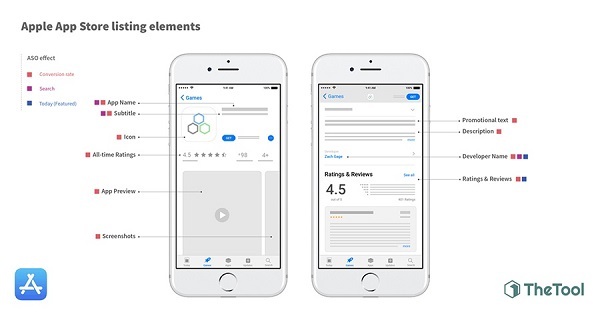 The icon is also very important in App Store, although the visual claim comes with the Screenshot Gallery, that allows to display up to 10 screenshots. It’s useful to show how the app works and can include a video that reproduces automatically. 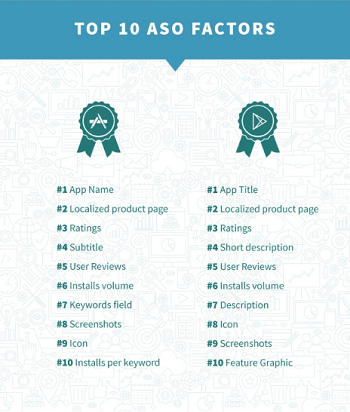 For more information on App Store ASO, this guide is for you! 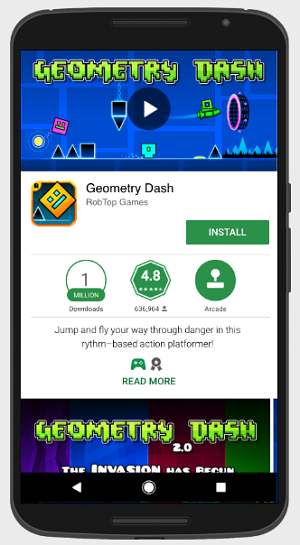 Installs volume, as it allows an app to rank better (data not available on App Store). Installs speed. The more installations in the less time possible the better. It affects the app’s position in Top Charts. User Ratings are good for conversion and they increase visibility on App Store. Average Rating has an influence on Conversion Rate, and it shows the average of all the ratings received. App Store shows this data by country. References on websites. It’s an ASO conversion factor, they give good publicity to the app. Engagement. A large number of active users will help to rank in Top Charts and Featured. It’s vital to realize that the mobile app business is always changing, there are always new tendencies and updates that make our strategies become old-fashioned really quickly. Therefore, the key to avoiding that is to keep our app always ready, as well as our ASO. We need to keep track of the most important KPIs periodically (daily would be the ideal), such as installs volume (organic and non-organic), keywords rankings, top charts rankings, and ratings and reviews. Update your keywords and remove the ones that don’t perform anymore, experiment with graphic elements and use A / B testing to see if these changes work properly for you or don’t. Be aware of your users’ feedback and provide them with the best user experience. Reply to their reviews and try to convert the negative ones into positive. If we can achieve this positive sentiment we’ll see an increase in our Conversion Rate and will also help our ASO. This guide will help you get started in the ASO process, but you need to remember that it’s a cycle and it needs constant monitoring in order to succeed. 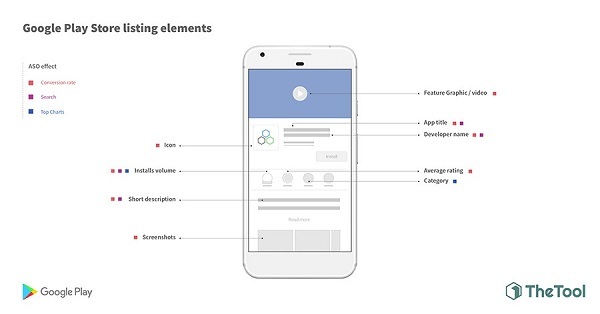 Experiment with different elements to find a perfect combination that increases Search and Top rankings, while convincing users to download your app. Moreover, keep in mind that ASO is not a magical process that will do all the work for you, you need to have a good product first! 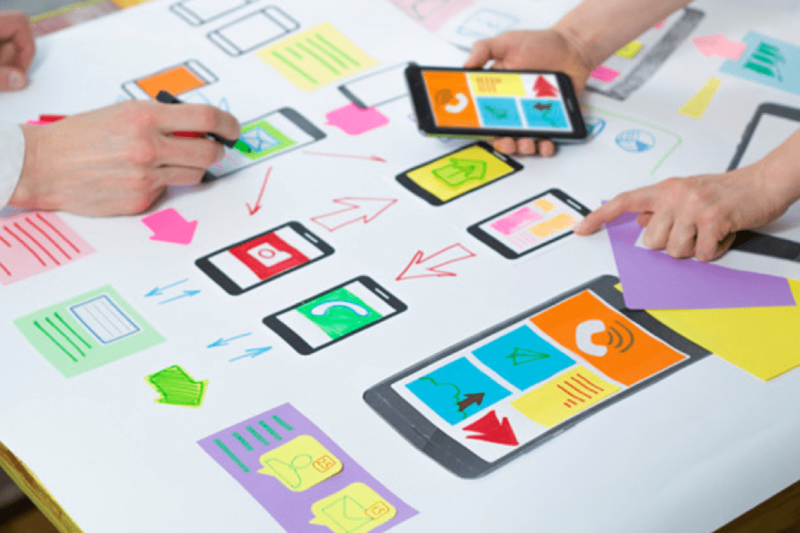 Take your time to develop your app or game and make it great. Our final tip is that there is always room for optimization, so never stop doing ASO! Gerard Gordon is Content and Social Media Manager at TheTool, a powerful performance-based mobile ASO tool that helps you track and optimize your app marketing strategy.